It’s a crazy world to keep up with. I am not referring to the violence, the weirdness or whatever your mind thinks when you hear those words, it is a crazy world. I am referring to all the social media that needs taking care of in the life of a writer and an author to keep their name front and center. Yesterday I spent most of the day working on a book trailer for my book “Whatchmacallit? Thingamajig?. It is book I wrote for my grandchildren putting them in adventures of helping their Grandma out of trouble. Along the way they learn a little more about their grandmother when she was young. I will admit it is not my best work but when I first wrote it I was only publishing it to have a hard copy for my grandchildren, but low and behold, it is selling. I have a Twitter account. Twitter is fun. I have a Pinterest account, so many ideas, so little time. I have a Stumbler Account, a Tumbler Account, a Facebook account, a LInked In Account, a Reddit Account and an Instagram account. I must admit I don’t know what to do with all of them, but they are important to get the word out about my writing. I am sure other authors may feel the same way. Each of these accounts are fun but the time that I spend on these accounts take away from the writing. Of course, add this blog, add my website julieseedorf.com and it is my crazy world. Then of course, I am waiting for my second book to be published which is “Granny Skewers A Scoundrel.” Then I will need to add more media for that book. I am also writing my second young reader book called Snicklefritz. Add my newspaper column, “Something About Nothing,” the articles I write for newspapers each week, and the third book I have started in my Fuchsia Minnesota series. Wow, I am tired reading this. I forgot about Goodreads. I love Goodreads. I love to read. My Kindle is full of books waiting for my sleepy eyes to be fixated on them so I don’t get any sleep at night. I am too intriqued by whatever story I am reading. I also decided to design cups and apparel to go with my books. I have the accounts set up and have a few things designed. The shop name is Hermiony after my character from the Fuchsia, Minnesota Series. Let’s not forget about book signings and blog tours. 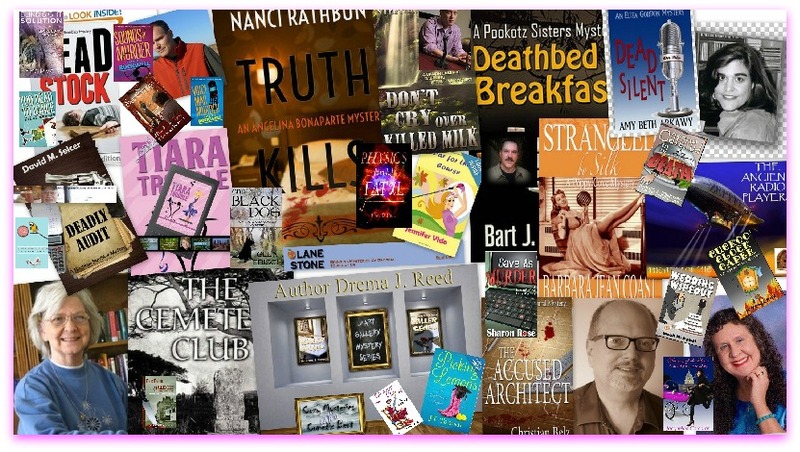 A few of the Cozy Cat Press Authors and I are starting a tour this spring introducing all of you to our unique fictional communities and our characters. heard a commercial and it said if you love what you doing and you get paid for it, it is called retirement. This is my retirement.” I agree with her statement. After leaving a career in computers and finally doing something I love, I can breath. Why am I writing all of this? I want people to know that writing is not an easy career. The authors that you see and hear and read about, aren’t like the ones in the books and movies where the scenery is beautiful and they work in a peaceful place and tap away on their keyboard. Writers have to market their wares and they have to keep writing. It is a job. Interruptions are hard because they break your train of thought. There is also writers block but they keep writing through that block until they find their inspiration again. To be successful writers have to write. They have to market their books and they are busy people. It might not be the type of busy that those that punch a time clock or work in the corporate world know. How hard is it to sit at a computer and write all day? To those that work in the world it looks easy. Ask a writer and see what they say. It is important if you have a writer friend to understand that they do have a career and they need the time to work at their career. We love books, we love inspiration and we love the creativity that is in those books but look past the pretty, the fun, the creativity, and look at the hard work that goes into those words. The blood, sweat and tears of parts of those authors are in their books. Their soul is in their books. Those books are released into the world for all to read and critique. Does that happen in most peoples jobs that the entire world can critique their performance? Writers are willing to take that chance that the world may not be kind. The world will love them, hate them, or toss them aside. Writers have courage. They let the world know who they are and they work hard to bare their imagination to that crazy world. Thank an author today for bringing you writing that challenges you, makes you laugh, helps you understand, moves your heart or makes you mad. Thank an author today if they took you to a fantasy world that let you leave the real world and all your problems behind for a few moments. They may have changed your life in some way. They will appreciate it. Tags: Albert Lea Tribune, Author, Coffee, Cozy Cat Press, Fuchsia, Granny Hooks A Crook, Something About Nothing, Whatchamacallit? Thingamajig? Next I’m Not Too Old For A Pillow Pet! Whew – I’m exhausted just thinking about all the social media you have to do! But the world is a much better place with you and Granny in it! Some beautiful thoughts, Julie. Yes, all the marketing can seem overwhelming. For my first book I was so heavy into the promotion that I didn’t write for a year. I finally said, “enough!” and got back to business. Endless marketing shrivels the creativity and doesn’t necessarily sell more books. Thanks for keeping things in perspective.